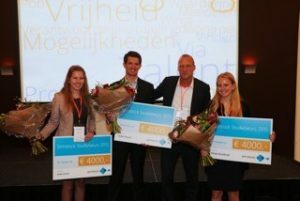 On Tuesday June 16, the Dutch company Slimstock awarded three scholarships to excellent students in the field of Supply Chain at the Dutch National Inventory Day. André Snoeck, visiting student at the Megacity Logistics Lab, received one of the awards to invest in his further academic development. This entry was posted in Grants, People, Uncategorized. Bookmark the permalink.